The thing about Final Fantasy XIV’s crafting is that it’s always been an odd mixture of wonderful and terrible, much like the game as a whole. You had crazily interconnected crafts that could be frustrating to level, the simple difficulty of trying to find the items you need, and a minigame that made mass production maddeningly slow. But you also had a real sense of personal craftsmanship, and the complex interplay between quality, durability, and progress meant that your successes or failures were truly your own. None of these elements has been removed from the beta phases, but each has been streamlined and largely improved. The test phases allowed us to explore the two crafting classes based in Gridania, Carpenter and Leatherworker, and so I got to really dive into the heart of working with wood and dead animal hides. It was a lot more fun than that summary might imply. 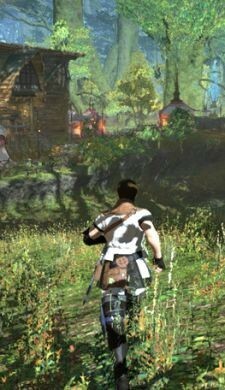 If you played a crafter in Final Fantasy XIV’s original incarnation, many elements of the system will be familiar, but you’ll start off with something immensely comforting. Just as Disciples of War and Magic have Hunting Logs and Disciples of the Land have Gathering Logs, your crafting class has a Crafting Log. Open it up and you’ll see a listing of recipes for your current level band. Instead of hunting down recipes externally, you can find them right in front of you without any tomfoolery. Some of you will feel like this takes the mystery out of playing the game. I am happy to no longer be tabbing back and forth desperately figuring out if I can use these Bone Chips for anything worthwhile. Once you select a recipe, your character kneels down and starts crafting, which brings up a familiar interface displaying item durability, quality, and overall progress. You then begin using abilities from your hotbar, starting out with just the basic crafting maneuver that increases progress and nothing else. Most crafting abilities cost a certain amount of CP, which works much like MP for combat classes or GP for gatherers. Lower-impact abilities cost fewer CP, and your CP is fully refreshed each time you start a new craft. The core of this is familiar to anyone who played a crafter in the first version of the game. But there are a lot of key differences, starting with the fact that progress is no longer gauged from 0-100. Instead, parts run from 0-30, while finished items run from 0-60. How much progress you make with each given use of your basic crafting action depends upon your level relative to the level of the item, naturally. Durability numbers have also been lowered, and pretty much every successful or unsuccessful action costs a flat 10 durability each time. This reduces complexity somewhat, but it also makes crafting feel a bit less like shooting in the dark. It was entirely possible to fail a craft in 1.0 simply by failing and getting big durability hits each time. Now, you know exactly how much time you have left to succeed or fail at a given craft. You might be able to add more durability on with certain abilities, but that also means spending more CP… meaning you can’t necessarily add more quality. That’s the other major change. No longer do you have four basic actions with varying potential effects. Your basic crafting action advances progress and nothing else. You quickly learn an ability that adds quality and nothing else. As you level more, you gain more varied abilities, allowing you to do things like restore durability (as mentioned above). But focusing on quality no longer also increases progress at a slower rate. Each action is meant to do something at a fairly reliable rate. All in all, the crafting revamp doesn’t feel very different, except that you’re no longer getting banged around unfairly by an uncooperative random number generator. The fact that your abilities are now on a hotbar instead of simply randomly popping up makes the whole thing feel more strategic and less like a case in which you just get marked to fail. Crafting, like gathering, has two major flaws, one of which is shared by gathering. Right now, content for crafters is limited to the (frequently amusing) class quests and a lot of leves, which are a bit spare. You’ve still got plenty of stuff to do, since you might want some high-quality boots or need to make the same item for multiple gear sets, but it still seems a bit spare. Certainly 1.0 was doing plenty to give crafters interesting things to do. The other issue could be seen as either more or less severe — as it stands, there’s not a whole lot of benefit to leveling multiple crafting classes in terms of cross-class abilities. In the launch version, there were plenty of benefits, but here it seems as if the slow roll of abilities eats up spots previously reserved for useful cross-class tricks. This is one of those things that I’ve talked about before, but some judgment should be held in reserve until we see how the other classes of this type play out. Overall, crafting manages to once again retain the flavor of the first version while still being a large improvement, which is impressive. I look forward to see what happens once we add a few more crafting classes to the mix.There are more content and services Click FFXIV Gil. This entry was posted in FFXIV Gil, Final Fantasy XIV. Bookmark the permalink.